If your male client is losing his hair prematurely then it could be affecting his confidence as many men believe they look older than their years when they are bald. Of course we know that most potential partners won't be put off by a lack of hair because the personality is far more important - however how do you get this across to your client? 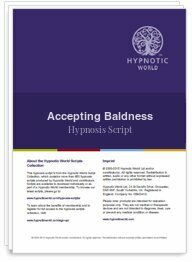 This Accepting Baldness hypnosis script from Hypnotic World works on creating and reinforcing the concept of a positive image in order to help your client to come to terms with his baldness and project himself as a confident individual. Download this Accepting Baldness hypnosis script today to help your male clients with their hair loss.